Three days left for this trip ……. 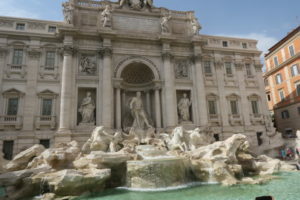 we arrived in Rome from Naples just before 2pm – after a short wait in the scorching sun, a taxi picks up and drops us at our final lodgings …. 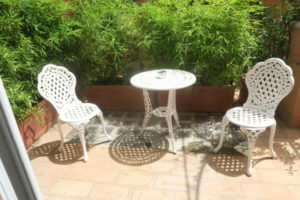 the “Tree Charme Spagna” boutique hotel. A modern, comfortable little hotel on a quiet street, approximately 5 blocks south of the Spanish Steps, 6 blocks north of the Trevi fountain, 9 blocks east of the Pantheon (or 26 from the Vatican) and 16 blocks west of the train station ….. with so much in between and all around. Lots to see, visit and do in this area. 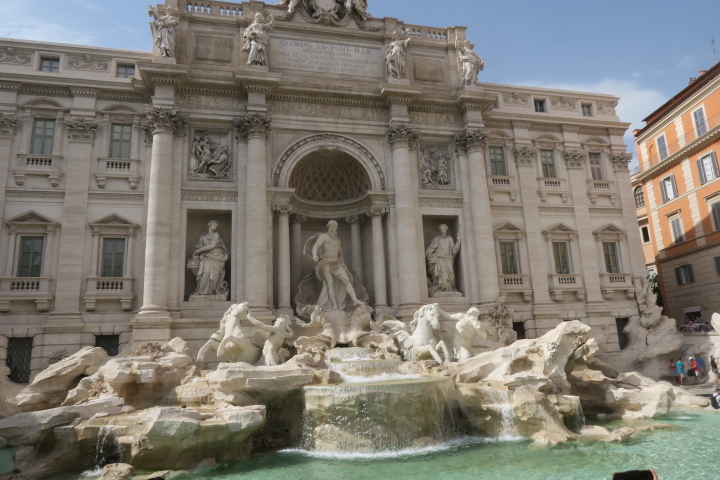 The last time we were here, the Trevi fountain was under repair and reconstruction …. all fixed now, and boy is it impressive! 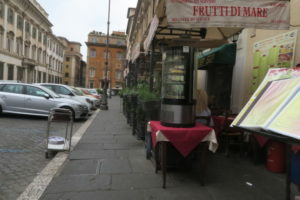 The first day in Rome and just like Sorrento, we are sweating buckets within the first 30 minutes ……. looks like another three-shower day with change of clothes each time. It also helps that some of the larger stores have very good air conditioning, so you can step in for some relief from the heat and humidity. 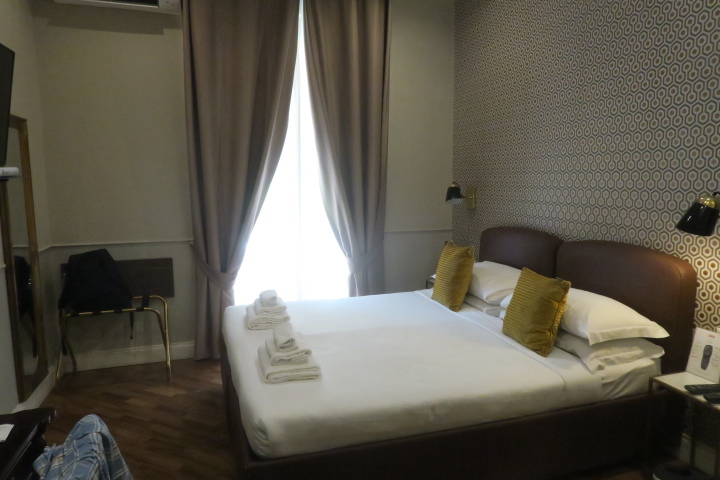 Thank goodness that we also picked a hotel with good air conditioning ….. can’t imagine trying to sleep in this heat ….. did I mention that the hotel room is quite nice with a terrace? Our order of business is to orient ourselves …… and it becomes obvious within minutes that the desk staff incorrectly marked the map, putting the hotel location on the opposite side of the street from where it really is. Once we get that straight it becomes so much easier to navigate ….. it also helps that we were here three years ago. As in pretty much every location we have eaten dinner in Europe, we don’t sit down for a meal until after 8pm. Same here in Rome ….. easier to eat and people watch later in the evening …. generally only tourists try to keep their North American meal schedule …. and when you really think about it – that’s insane, because our internal clocks are at least 6 hours behind the local time. For us 8pm here is only 12pm noon back home. Tonight it’s dinner at the “Piazza della Rotonda” beside the Pantheon, watching the water spray in the “Fontana del Pantheon” and the people pass by … the meal was interesting – grilled fish (everything) for Gerda and seafood spaghetti for Brian ….. we both have had better but it was the location and people around us that made the meal. Afterwards a gelato (ice cream) and then a stroll back to the hotel ……. no blogging tonight, the application site is down and not available for the third time on this trip …. need to straighten this out with the service provider when we get back home. Breakfast is included with the room rental, so we make sure we are up, showered and there before the morning cut-off. Simple fare, but it takes the edge off the hunger, although with the heat and humidity, I find I’m never all that hungry …. counter-intuitive. Today we decide to visit some of the impressive buildings and ruins in the area starting with “Piazza del Popolo” near the old city’s northern gate …. 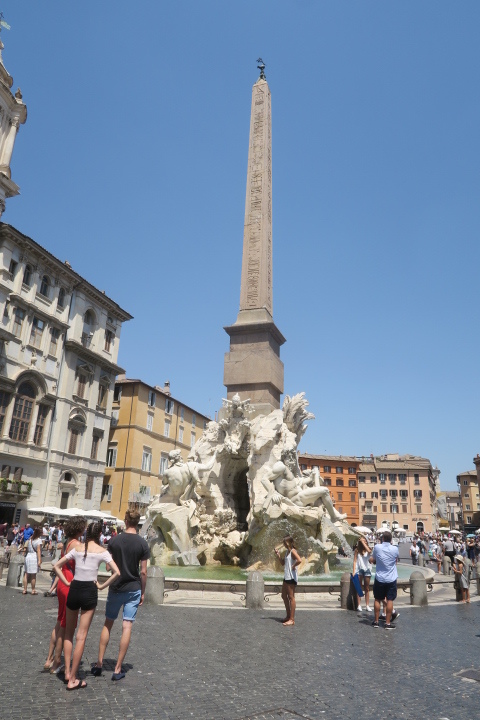 wide open space with Rome’s oldest obelisk ….. 140 ft high and dating from 1500 BC in Egypt – very impressive (an overused word but deserved). 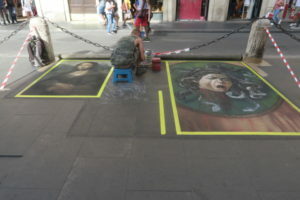 We leave the area down one of the major streets “Via del Corso”, which has been partially blocked for pedestrians, so we can enjoy the street musicians and artists …. and there were lots to listen to or watch. We leave the area down one of the major streets “Via del Corso”, which has been partially blocked for pedestrians, so we can enjoy the street musicians and artists …. and there were lots of them to listen to or watch. 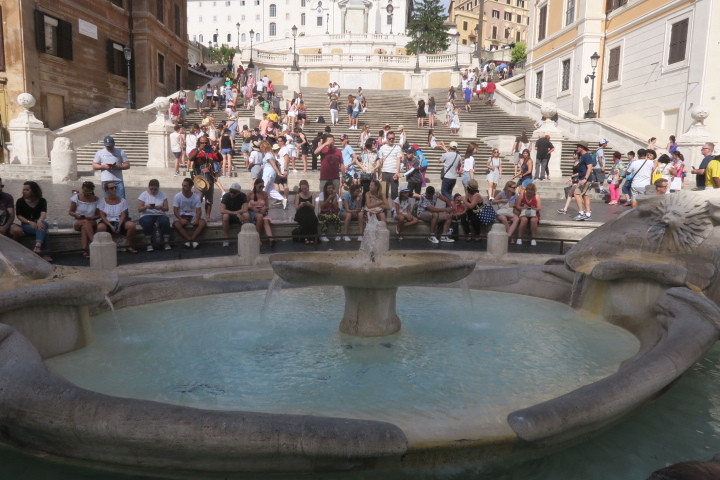 Our next stop on our walking tour was Piazza Navona, with several fountains (one with Zeus like figures) …. or so we thought. On the way, we made a catch and release stop at a unique jewellery and clothing store, where Gerda did major damage with her “fishing” program and even tried on a hat ……. looking cool. From this distraction we headed south ….. yep – in the wrong direction and ended up at an ancient ruin we didn’t know about …. 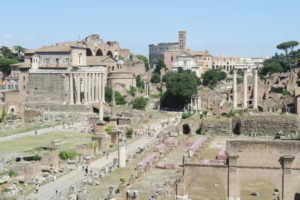 “Largo di Torre Argentina” …. 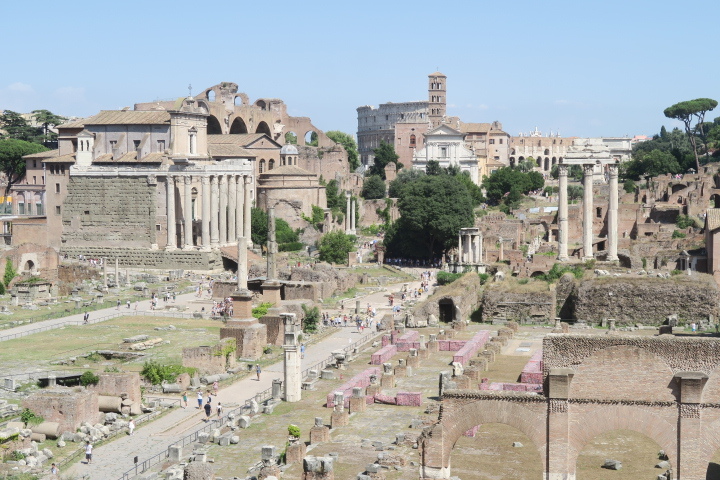 a roman square, with four Rome Republic temples and a theater … all in ruin with just some pillars standing. Sad to see the disrepair …. but all empires crumble – some more spectacularly than others. Gerda confirms with a local where we were on the map and got some directions to Piazza Navona (back north and west) and after 15 minutes walking, we find it. 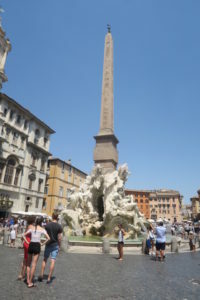 Fortunately it’s early afternoon and hot, so there isn’t a huge crowd and we can rest briefly and get some great pictures of the three fountains – featuring in the centre of the piazza, the 16th century Fiumi Fountain, topped by the second Egyptian style obelisk from 80AD. 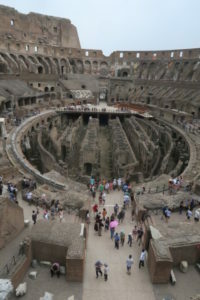 The Italians (and Romans) love their massive stone art ……..
Moving on from there, we head further north-east, across the Tiber river to the “Castel Sant’Angelo” where they have a ‘market’ in progress. The castle is another massive stone structure, built in the first century as a tomb for the Roman emperor Hadrian, now used as a museum. That’s now 4.3km on our walk …… besides being hot, we are getting tired, so window shopping in the tree–shaded, tent market is refreshing, even though there are no real windows to shop in. After that short break …. the Vatican is 10 blocks east. Our next stop is 5 blocks in at the “Leonardo Da Vinci Museum Experience” …… with great models of his many inventions …. Gerda buys a few t-shirts for relatives …. and we move on, heading into the Jewish quarter (originally called the Roman Ghetto). 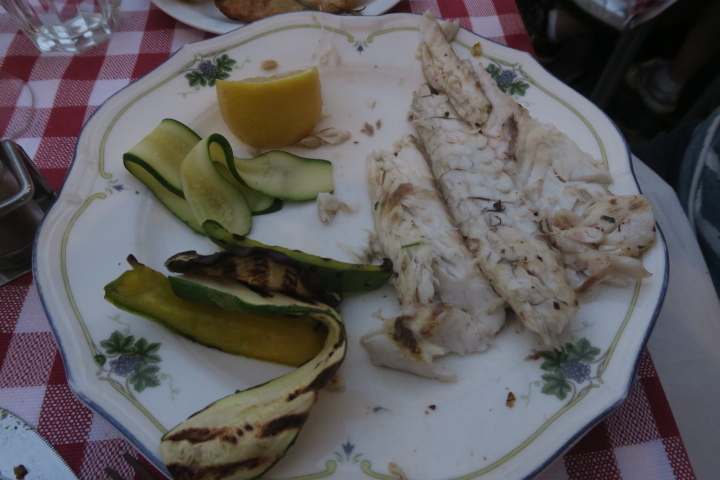 Late lunch time at Taverna della Scala …. refreshing Italian beer and bruschetta. Then, we wander through the vendor stalls near the Basillica di Santa Maria in Trastevere. In relative time, after what seemed like a half hour (but was really only 30 minutes) we arrive at the Ponte Cestlo (bridge) to the only island in the Tiber river. Once across, we are not far from the backside of the main Roman ruins. Time to rest and perhaps catch a taxi – we have now gone close to 7.5 km – but the traffic is going too fast ….. so we push on slowly, trying to keep to the shade – it’s close to 40C. 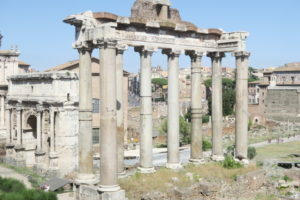 After wandering in circles for another half hour, we finally found our way to Via Monte Tarpeo, where we rested again and got some great pictures of the backside of the “Tempio di Saturno” (500BC), “Column of Phocas” (200AD) and “Basilica Julia” all a part of the original Roman Forum built in between 200BC and 12BC, now in ruins. Again majestic old structures and sad to see the decay. Walking pass the backend of the “Monumento Nazionale a Vittorio Emanuele II” (a monument built in honor of Victor Emmanuel, the first king of a unified Italy) we catch a taxi, deciding it’s time to ride back to our lodgings ….. well, after walking 9 km in 40C weather wouldn’t you. Great cabbie, when he sees we are over heated, he closes the windows and turns up the air conditioning …. undoubtedly the best taxi ride of our trip! We get back to the hotel just after 4:00pm and drag ourselves up to the room for a shower and nap … 3 hours later, feeling much refreshed, we head out for dinner. After wandering for an hour trying to find that unique restaurant experience, we settle on an indoor spot a few blocks north of the Trevi Fountain …. The “greeter” reminds me of Steven Segal. The meal is not exceptional, but we do end up with an interesting story. While Brian is finishing his meal he notices a screw on the plate. 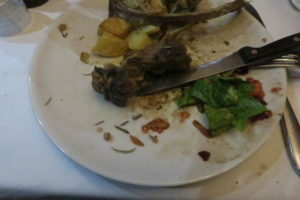 When the waiter picks up the plates, Brian points it out to him …… the staff goes into panic mode., scurrying around …. After 10 minutes Steven Segal comes over picks up the salt shaker and points to the bottom grinder where …. you got it, a screw is missing. Whew, what a relief …. Hate to think the meal was cooked with a screw. Breakfast by mid-morning, and it’s out to sweat again ….. 10 minutes and we’re both fanning our selves to slow the wet. First stop this morning, check-out the souvenirs and finalize the gifts to take home. So many choices ……. afterwards, we stop at a shoe store right by the Trevi Fountain … there are several styles that Gerda likes. She decides we’ll pick them up later, since we decided on the spot to visit the Colosseum. The tickets are readily available and we can get a bus ride to the site …. done. Only it turns out we have to wait 40 minutes for the bus (the electronic sign said 15 to 43 minute wait and of course it was the 40 minutes). When we get there we are told to go to an office on the other side of the highway to get them validated …… so much for “skip the line” tickets. We finally get them validated although it took 30 minutes and then we were shunted around the Colosseum several times. In the end we did skip the line, but still had to go through security and their x-ray machine. They say only 3000 people can be on site at any one time ……. The crowds were large around certain parts of the Colosseum, but nowhere near capacity. This site has undergone and is continuing to have major reconstruction …… probably without it many areas of the site would be inaccessible. Kudos to all the people dedicated to providing safe access for the general public to view this marvel of the ancient Romans. After wandering on site for an hour and a half, we leave and walk up the main road back towards our hotel. 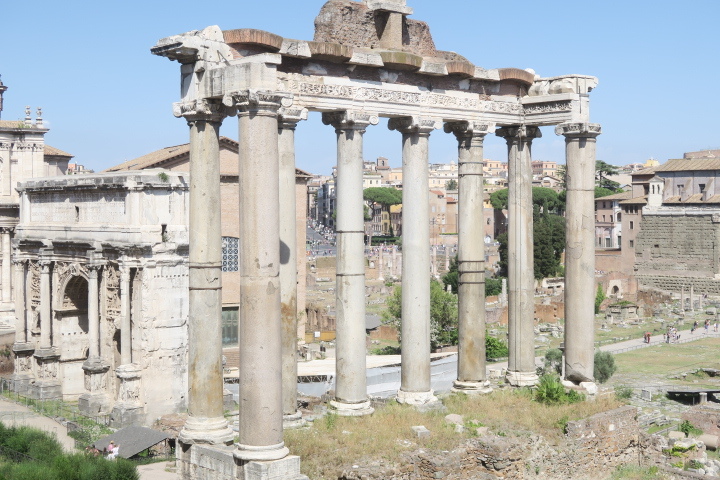 We get to see (again) the front side of the ruins that we saw yesterday from the rear …. just as impressive. When we reach the main area of the old city, we decide it’s time for lunch (yea, 2:00pm lunch). We finally sit in an outdoor restaurant not far of the main drag. After ordering, we start to have second thoughts about our choice. The owner, starts arguing with some potential customers trying to decide if the menu was right for them ….. they move on and the owner starts arguing with his servers, clearly dressing them down. He then gets in his Porsche convertible and takes off …. not very inspiring. Did I say he reminded me of Michael Corleone from the “Godfather”? He’s gone and are drinks and food come so we stay. An okay meal …. again nothing inspiring. As we pay the bill, Gerda points out the thing we missed which was a dead give-away of the restaurant service …. Three wheels on the serving cart. We both burst out laughing …. Got to remember that for future encounters. 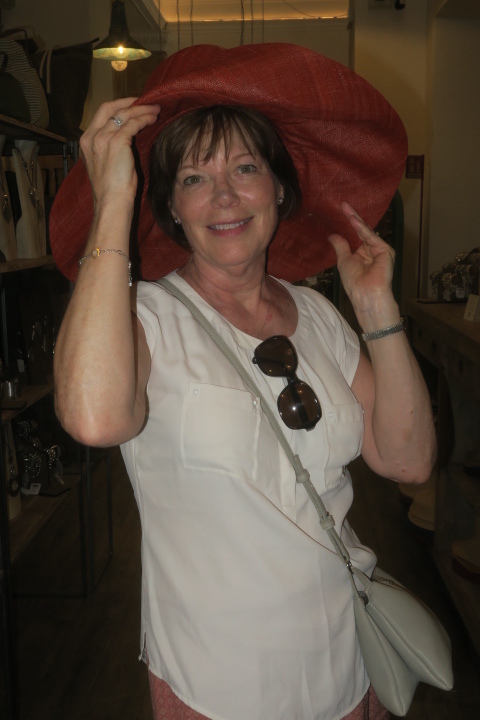 Moving forward, we go back to the shoe store where Gerda ….. finally decides on two pair …. and we head back to the hotel – yep, you guessed it, another shower, nap and a change of clothes. Final dinner … and we’re looking for the “experience” we’ve missed so far. Well we stumble on it ….. a nice little restaurant called “Ristorante da Diego” – 61 Vicolo Sciarra . The outdoor portion is in the alley behind … quiet and secluded. 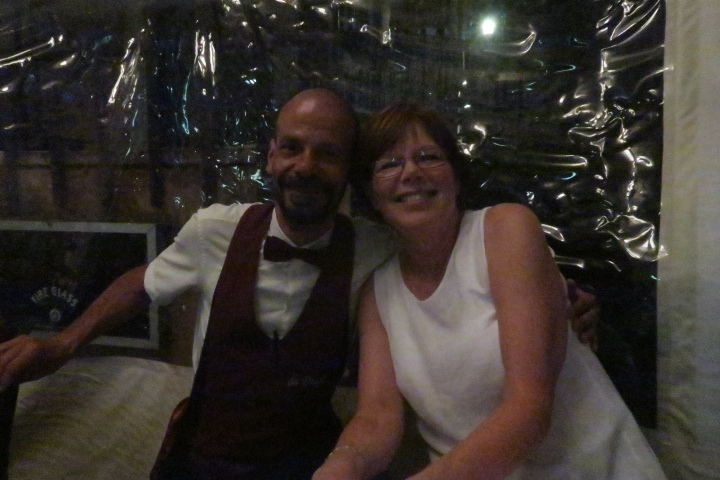 Our Waiter Michele is both gracious and funny. He knows how to take care of the customers he is serving. It started off very well and ended exceptionally. The meal was the best we had in Rome. Next time we come, we’ll have to see if the restaurant and Michele are still there. The evening was capped by ….. thunder and a torrential downpour. Any other place and we would have gotten wet … they had us cover, literally – top and sides with roll down clear plastic. Sign of a good restaurant – being prepared. Thanks Michele! Last stop for the night …. pickup another piece of luggage for the souvenirs. For 27€ we got the ideal bag …. just right for carry on …. now to go back to the hotel and repack. Half an hour after we start, we’re done and ready for tomorrow’s trip home. Well the plane is currently scheduled to leave at 1:30, so we decide to head to the airport by 10:00am. Then we get a notice that the flight is delayed to 2:30 … so we reschedule our taxi and go for one last walk-about. And then it’s time to go. The drive to the airport is uneventful. Upon arrival it takes us 10 minutes to find and get through check-in … we are directed to another area for security, which takes all of 15 minutes to go through and then customs passport, which takes another 15 minutes ………. that was fast, so now we have 2 hours to kill! The airport is one of the nicest we’ve been through – friendly and efficient …… and then Air Canada spoiled it by having such a dis-organized gating procedure! Oh well, can’t win at everything. On a great note for Gerda, this is the first time in five years where she was not “randomly” chosen for the full security body search. Congratulations Gerda ….. great way to end a vacation trip!